Birthday Parties are fun with Delta Force! Prepare yourself for an absolutely unforgettable day with Delta Force Paintball. We welcome birthday parties of all sizes here, and we can cater to your needs. With over 25 years experience in entertaining kids and hosting birthday parties, we are sure we can make your special day memorable. Safety and fun are our two main priorities, and we won’t let you down. We are the industry leaders in paintball worldwide, and keep our 100% safety record with the correct safety practices and procedures. We can promise that your children will be kept safe, but we can’t guarantee they won’t be a bit dirty after a day out playing paintball! Give your kids an unforgettable day out – take them paintballing. It’s a tough job keeping kids entertained, we get it. 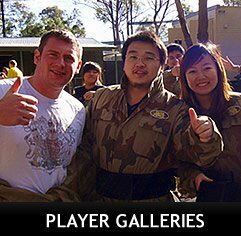 We’ve have over 25 years experience in proving a paintball experience that is fun and memorable. Bring your kids and we will promise to give them a day out that will have them sleeping in the car on the way home. Bring them to Delta Force Paintball and let their imaginations run free on our truly immersive game zone scenarios. When sending out invitations, please remember that New South Wales has a minimum playing age of 16. We are unable to change the law, sorry for any inconvenience.